One of the many highlights of the Homeric Writers’ Retreat, which I had the pleasure of attending earlier this month on the Greek island of Ithaca, was witnessing a young boy, aged about five, shyly but proudly approaching our group as we sat chatting by the hotel pool, to share with us the story that he’d written. On returning home, clearing out a dusty box of papers from beneath my desk, by chance I came across a trio of stories dictated by my daughter Laura before she started school. Reading them now at the ripe old age of 11, she finds them terribly funny, but I’m touched by how completely that young storyteller, like the boy in Ithaca, was immersed in her own world of make-believe. I’m reproducing them below for your entertainment. Long may children continue to write with such obvious passion and pleasure, their imaginations and values undimmed by the abundance of distractions in our modern age. There was a family and they lived happily together and that morning the postman came and the birds were singing and they went to the playpark before they had their breakfast and they loved to go on the slide and it was very lovely and they played and played and played. They really liked it at the playpark so they went on the swings and on the slide and on the roundabout and they were singing “halalalloo” and they were doing a show in the afternoon to their friends and they loved to go on the swings because they kept standing up on the swings and they didn’t fall down. They were always going on the slide and on the roundabout because they were so lovely and the postman came every day. The old lady looked after them. The superlady was coming and the superman in case there was any trouble and there wasn’t any trouble. The Tumbletots lady and the Tumbletots little girl came and played with them and tried to help at school with them. Then the man which didn’t like the pony and the horsey and the unicorn came then the superlady and the superman came and got things off him then the naughty man liked them. Once upon a time a big frog came and ate Milly Molly Mandy all up and Billy Blunt and Little Friend Susan. They couldn’t go anywhere and had to stay in the frog’s tummy. Another frog came and ate other people all up. Another frog came and ate the boys and girls up. A cat came (Milly Molly Mandy’s cat) and ate all the frogs up and Milly Molly Mandy and Billy Blunt and Little Friend Susan. Some other people rescued them and they went home for tea. What a wonderful find, and so visionary! With the way Amazon is forcing major changes to delivery models, soon the postman may be coming every day! 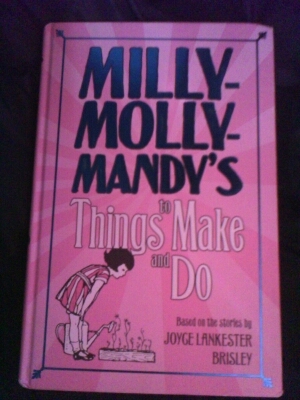 PS I remember getting all the Milly Molly Mandy books out of the library when I was little! Founded my taste for family stories. I love Milly Molly Mandy too, Clare, and was very pleased when Laura reached an age where I had the excuse to read them all again! Love it! We recently re-found lots of this stuff among the things our kids had left behind in the attic … being 3 of them, 2 of them twins, they seem to’ve managed together, writing similar stories without the parents’ knowledge! And they didn’t show us! Except for our daughter who shared her Little Green Jumping Bean story in show & tell at school – LGJB was a frog. And a recipe for a cake – which I remember I helped them make. It worked. Must’ve been old enough to know a thing or 2 by then. I love the LGJB frog idea – that could be a classic! I think we still have LIttle Green Jumping Bean filed carefully back in the attic!